Dyeing Easter eggs must be one of the craftiest traditions of the season. There are a million ways to do it, but most of them include special, expensive or synthetic materials. This year we suggest you try a more simple and natural approach to coloring your Easter eggs with all-natural ingredients. Dyeing eggs, when did the tradition begin? Like most traditions and celebrations, Easter has its roots hundreds of years before us. Some argue that what we now celebrate as Easter is a derivation of ancient pagan rituals kept in Europe where they observed the Spring Equinox as the return of the Sun God. Adopted as a Christian tradition, for the Orthodox and Eastern Catholic Churches, the egg is symbolic of the resurrection of Jesus Christ. Initially, the eggs were colored in red to represent the blood that Jesus shed in the cross. Want to know more about the origins of Easter traditions? Click here to read our post about it. Egg shells, as hard as they seem, are permeable so anything we use to color the outside will eventually get on the inside. Artificial dyes are mostly made from derived from petroleum byproducts like tartrazine and erythrosine or by burning coal tar. With the process, the white of the egg will inevitably get tainted, and even if you don’t eat them, traces of these chemicals will get in your system through your fingers. Bring the amount of water need and the color ingredient to a boil, then turn the heat down to a simmer. Cover it for 15 to 60 minutes until the infusion reaches the desired color. Remove the dye from de heat and let it cool to room temperature. Pour it through a strainer into bowls and add 1 tablespoon of vinegar for each cup of dye. Reserve. Add eggs to a pot and cover them with water. Once the water has reached a hard boil, turn off the heat, cover them, and reserve for 10 minutes. Place the eggs in a bowl with cold water and let them cool down to room temperature. Drain the bowl and gently wash the eggs with a drop of non-toxic soap to help the natural dye adhere to the eggshell. Lower the eggs into the reserved dye and place them in the refrigerator. Soak until you see they have the desired color. 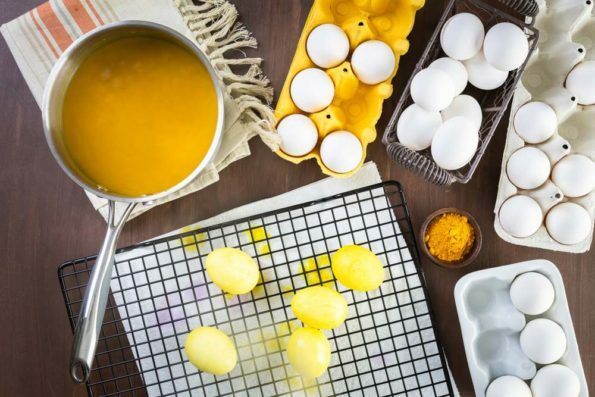 Once they reach a hue you like, scoop them out and place them over a cooling rack or an upside-down egg carton. Burma spice tip: natural dye has a matte finish if you want your eggs to be shiny, gently rub a drop of coconut or olive oil. Blue shades: 2 cups of shredded purple cabbage and the amount of water to cover it in a medium pot. White eggs will turn blue, while brown ones will turn green. Yellow: 2 tablespoons of ground turmeric and 1 cup of water, or carrot peels in 12 oz of water. Orange: 2 cups of yellow onion skins and enough water to cover them in a medium pot. Red shades: 2 cups of peeled, grated beets in 2 cups of water. Now that you’re ready to have the most fun Easter egg hunt ever, prepare an unforgettable Easter brunch with these delicious and contemporary recipes!